The fickle finger of fate led a fashion-conscious fellow to a finished fringed garment, a fait accompli, a failsafe facsimile of mountain manwear to impress family and friends. No factory-made article, this, but fabric sewn with faceted skill, a fantasy made for this fellow, as if by a faithful fairy godmother. In one facile move, the fellow forked over the fabled fee. And with his facetious friendmaker, he forayed out in fabulous fashion. Photo credit: our son Eric, model for my last ABC Wednesday post, E is for Ear Wax, and author of the blog Musings of a Wandering Physicist. 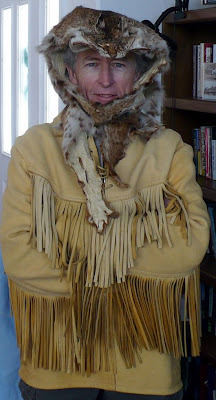 Does my fella look like a mountain man, or what? 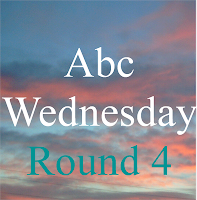 For more ABC Wednesday posts, click here. The third week of February, we make an annual trek on Jones Hole Creek from the fish hatchery to the Green River and back. (Four miles each way. Part of the trail is within Dinosaur National Monument, so our dog Daisy isn't allowed.) The attraction is that baetis (early-season mayflies)begin emerging along the Green at this time of year, and some years the fishing is excellent. We were surprised to find so much snow along the trail, but the baetis were there. Steve and a friend fished, both on the Green and on the way back. They just didn't catch anything. This was one of those times when the fish didn't seem to care what bounced off their noses. We smelled a skunk about halfway along the trail. Maybe that should have given us a hint about what the fishing would be like. The fisherguys returned a little discouraged. explored by archeologists in the '60's. (They were flooded out while working, thus the site's name.) This site is said to have been inhabited intermittently for the last 7000 years. Pictographs are found on the rock walls near the site. And on the drive to the Hole, a golden eagle hung on the Diamond Mountain thermals beside us as we went up the switchbacks. Alas, I wasn't quick enough with the camera. It was a great day to get out and see our world. For other fun and interesting worlds, click here. Sunny skies today, and temperatures in the 40's. We rode in the Cedars again. The snow is getting thin, even in the shady spots, and it's mostly gone in the sun. When Daisy got hot, she took advantage of a snow patch for a good roll down a little hill on her back. We explored a new canyon where Steve, of the eagle eyes, spotted something on the cliffs. Lots of twigs were piled up, about 4 feet in diameter. The plethora of bird droppings indicate a large bird of some kind has nested there. What do you think? A golden eagle, maybe? It's too early for nesting, so we'll have to go back when the weather warms and see what we can see. Eagle-eye Steve also spotted this small petroglyph. I think it looks like two people holding hands. It was located on a flat rock panel immediately above a boggy area with cattails growing in it, indicating year-round water. With an appropriate panel near reliable water, we're always on the lookout for rock art. Here's a creek we crossed coming and going. If you click on the photo to enlarge, you'll see a tiny star of light in the stream. I thought it was cool. We rode 11 miles in 2.5 hours with 1000 feet of elevation gain, a good exercise outing for all. No shoes or boots for the horses today. We're aiming to go barefoot as much as possible this year. At home, Daisy maintains the veneer of civilization. She's a house dog, and although she has been known to steal a crust of bread off the counter, she generally behaves indoors. But out in the wilderness is another story. Here, she's meeting face to face with a young elk. Neither of them seem to know how to react. Here she is chasing an antelope. She's the golden, cougar-like blur on the left. This antelope was all by herself and kept coming back to the little valley where we were riding. Daisy would chase her briefly, then return. One time, Daisy chased the antelope over a hill, and when our dog came back, the antelope was chasing her! In the first second, the antelope is following Daisy. Then, as the antelope catches up, Daisy appears to lunge at it. Very quickly, the antelope outpaces our girl. We realized at that point that something unusual was going on. We put Daisy on a leash to prevent chasing and watched from a distance. The antelope stayed close but remained wary. We decided she must have a baby hidden nearby, so we left so she could return to her motherly mission. About a week later, we went back to that valley, with Daisy contained, and saw an antelope with twin babies running over a hill. I really, really, really love hoof clippings. Any more there for me? I took this photo over the weekend after Steve pointed out the plume. Doesn't it look a bit like a tornado? But the sky was clear and the wind was still. It turned out to be just someone's trash fire, soon dissipated. No sirens, and no reason to panic -- quite fortunately for us and the farmhouses that were closer. We've had serious fires in Utah, so we don't take them lightly. For skies all over the world, click here. We’ve been eager to get the horses out for a ride, and today was our chance. Steve was off work, the temperatures were low 40’s, mostly sunny. Even with a brisk wind, we were able to bundle up and stay warm. We loaded the horses and trailered to the Cedars, about 2 miles from the house. At 6000 feet in elevation, the snow is nearly melted there. After a three month vacation, Mischief danced a bit at first, then settled down. to a rocky-bottom creek that was partially iced over. (Darn, I didn't think about pulling out the camera there.) In trying to avoid the rocks, Boss broke through the ice and plunged across. Mischief stopped in the middle, never mind the rocks, and enjoyed a nice cold drink. We rode along the road on the other side, then circled back toward the trailer. Daisy had great fun chasing jackrabbits. When she got hot, she lay in the snow. Several times, she slid on her belly down a little snowy hill, kind of like an otter sliding down an embankment. I wish I could have gotten a photo of that, but I missed it. Maybe next time. We were out a couple of hours for a total of 7.5 miles, 500 feet elevation gain. E is for Ear Wax. Upon an examiner eliciting evidence of execrable ear efficiency, the examinee expects the expert execution of effortless extraction. Examinee is elated at an efficacious, excellent, effective end. I expect erudite readers will eek and eww at the exited ear wax. Ergo, you may excoriate me in exasperated editorials. For other excruciating or exciting E words, click here. The site above, located perhaps a hundred feet below the top of the cliffs, is difficult to find. Click on the photo above to see 2 people standing at the level of the ruins. Access looks impossible, but it's not as bad as you might think. The approach is from the opposite side of the canyon, down a narrow ledge that must be traversed single file - scary, but safe enough if you're careful. After reaching the site level, you can walk around in a semi-circle (out of sight to the right in the above photo) to the ruins. 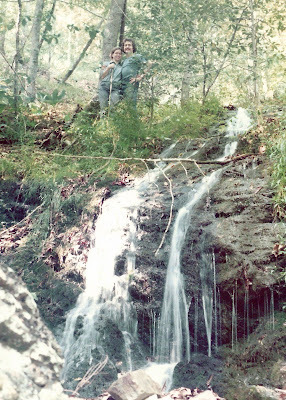 Along the way, you'll pass a spring with vegetation growing in the rock cracks where the water seeps through. 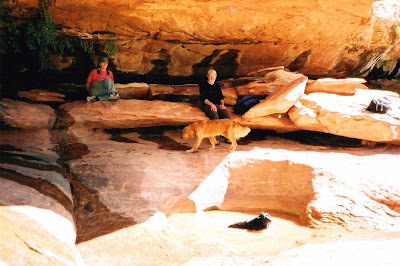 Steve climbed down into an enclosed, rounded structure called a kiva. Note the convenient shelf for storage. Probably the people chose this site for safety from enemies. They most likely grew crops on the land above. Can you imagine tending a 2 year old while living there? I've often thought they must have tethered the children until they were old and wise enough to avoid the edge. For photos and tales from other worlds, click here. 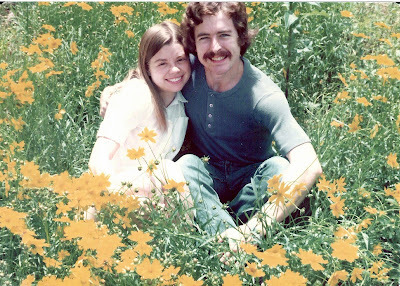 On a Valentine’s Day long, long ago (‘70’s) in the "city that care forgot" (New Orleans, Louisiana), boy and girl (Steve and Janie) had their first conversation in a parking lot at Charity Hospital. They went to a Mardi Gras parade for a first date, and Steve caught an entire bag of beads -- an auspicious omen, don’t you think? They found that they had much in common. They had read many of the same books, enjoyed asking questions, seeking answers and exploring all things natural. 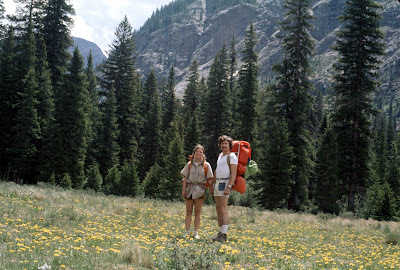 They liked to hike and ride horses, and generally be outdoors. They were in accord on most facets of life. And so they hung out together, and eventually married. 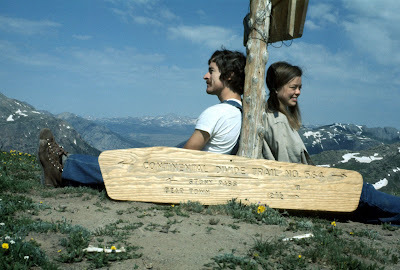 Early on, they fell in love with the mountains. 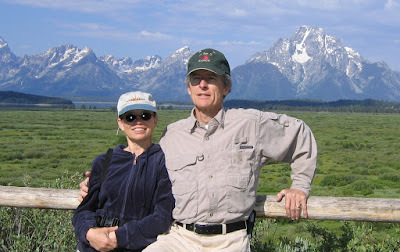 Three kids and 17 years later, the whole family moved to Utah, where the clan had many seasons of fun hiking over hills and desert and through the wildflowers. The kids grew up. They celebrated weddings and the birth of three grandchildren. Janie and Steve have a life to themselves again, boy and girl. (A little wrinkled and ragged around the edges but inside, they haven’t changed too much.) They are still talking, satisfying curiosity, riding, hiking, exploring. And they hope to do so for many Valentine days to come.